Skyworks’ extensive wireless portfolio is designed to offer convenience and safety for many automotive applications such as using infotainment systems, telematics, collision avoidance, toll transponders, and vehicle tracking tools. Skyworks’ Wi-Fi (IEEE 802.11), ZigBee®/802.15.4, and Bluetooth® products are used in an array of home devices including smart thermostats, security systems, sensors, light switches, smoke/CO alarms, appliances, door locks, routers, high definition televisions, gaming consoles, and much more. Skyworks’ innovative industrial solutions are able to meet the demands and requirements for applications such as factory automation, commercial aircraft, smart metering, security cameras, and smart agriculture. 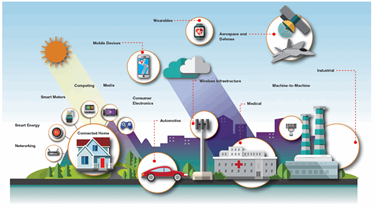 Skyworks provides a portfolio of cellular, short-range, and global positioning solutions supporting M2M applications including automation, telemetry, and asset management. Skyworks endeavors to integrate innovative technologies into medical products to enable magnetic resonance imaging, monitoring equipment, and telemetry. Solutions such as amplifiers and diodes are key elements in medical instruments such as blood sugar monitors, defibrillators, hearing aids, heart monitors, pacemakers, and MRI scanners. Skyworks’ high performance mobile connectivity solutions are found in wireless mobile devices such as multi-band headsets, smartphones, tablets, data cards, and wireless local area network (WLAN) systems. Skyworks’ portfolio of products are designed to enable smart energy instruments such as smart meters, smart thermostats, in-home displays, plugin hybrid electric vehicles, ZigBee® / 802.15.4, Bluetooth® and Bluetooth® low energy applications. From smartwatches to smart eyewear, fitness trackers, and health monitors, Skyworks offers superior, small form factor solutions that consume minimal power and enable “always on connectivity,” allowing applications to run in the background for lengthy periods of time without a battery recharge. Please visit Skyworks’ Internet of Things site at www.skyworksinc.com/iot, or download the IoT Brochure for more information on their IoT solutions.